Griot’s Garage Drying Towel is a super absorbent waffle weave drying towel that will leave your paint dry and scratch free. It’s large size (a full 25 x 35 inches!) means you’ll be using less towels to dry your paint. Equipped with sewn in pockets that help you dry hard to reach areas, the Griot’s Garage Drying Towel is everything you’ve needed from a drying towel. 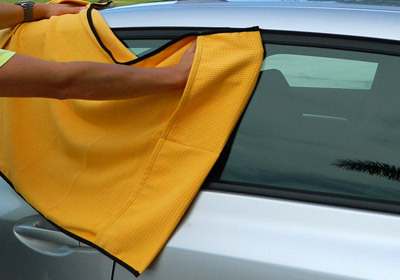 Griot's Garage Drying Towel has sewn in pockets to help you dry hard to reach areas. Waffle weave is the preferred microfiber design for most drying towels. The waffle weave increases the surface area of the towel, making absorbing the water on your car fast and easy. The super soft microfiber used in production for the Griot’s Garage Drying Towel will not scratch or mar your paint. The Griot’s Garage Drying Towel also utilizes a soft satin edging that also helps prevent swirls and scratches while drying the paint. Griot’s Garage also went a step further with their drying towels by sewing in side pockets to help you dry the harder to reach areas. When you’re drying a large SUV or even an RV or large truck, you’ll be grateful for those pockets! The Griot’s Garage Drying Towel is already larger than your average drying towel and these pockets make it feel even larger and more cost-effective. A good, dedicated drying towel is definitely a must for your detailing collection, and the Griot’s Garage Drying Towel fits the bill perfectly. Proswaffle-weave absorbs water, Sewn in pockets "Towel just glides across the car!" I bought this towel directly from Griot's about 2.5 years ago. (This was before I heard of AG.) It's big, but not overwhelmingly big. I do like the pockets for your hands. Because it covers a wide area, it dries very quickly. It absorbs quite a bit of water and I can dry the entire car after doing a rinseless wash without a problem. After doing a 2BW, I typically have to grab another towel. Because of its size, I do have some problems when I am drying the lower half of the door panels, and this is basically having to really pay attention to whether the towel is hitting the ground or the tires. I suppose you can't have it both ways -- either you're going to use a big towel and have these issues or you're going to use small towels and go through a few of them. I'd definitely buy this towel again. ConsLarge size makes is a little difficult along the lower panels Has stitched edges and I wonder if they ever scratch the paint -- I don't think so, really. On the pricey side of towels.